The DFG82 series laboratory grade mechanical force gages are durable yet highly accurate, making them ideal for your tension and compression quality control measurements. The DFG82 gauges are sold in kits, complete with meter, hard case, measuring adapters (flat head, cone, chisel, notched,small hook, large hook, and fork), and extension rod. 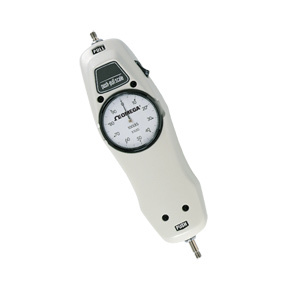 The ergonomic design is well suited for hand held testing. Nota: The DFG82 is sold as a complete kit including a hard case, measuring adapters (flat head, cone, chisel, notched,small hook, large hook, and fork), and extension rod.